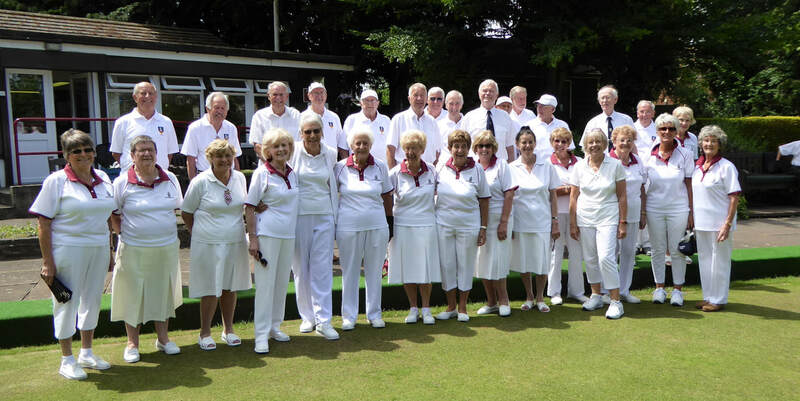 Peggy's Triples Day competition carries on in honour of past member Peggy Bates. Peggy joined Clockhouse in 1986 and she was Captain, Match Sec. and on various Committees. She had organised her Peggy,s Triples Day for many years and celebrated her 90th birthday in 2013. She passed away in 2015 but the competition carries on. This year Peggy's husband, John, came along to give his support. Tea and big cream cakes, made by Bev Plank, completed a successful event. 30 members made up 10 triples, each playing 3 rounds of 6 ends. There was only 1 team with a full house of wins. ​Ken Brand, Pat Norton and Debbie Walmsley were the successful team seen here with John Bates. 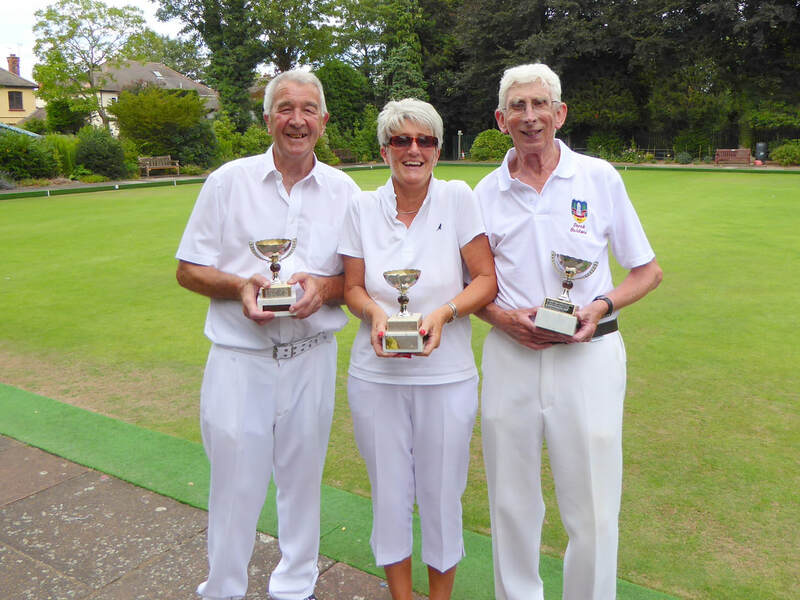 The Ron Errington Trophy Mixed Triples competition took place on Sunday 12th August. 30 members made up 10 triples teams each playing 3 rounds of 6 ends. There were 3 teams with a maximum 6 points, so the result had to be decided on shot difference. The winners were Margaret Tinton, Val Hayes and Peter Lowe with a shot difference of +21. ​Runners up, with a shot difference of +14 were Jenny Bullock, Charles Rolph and Debbie Walmsley. Our own Hayley Kenny competed in the National Junior Singles at Leamington on Sunday 5th August, with a 3 match winning run through to the Quarter Finals. In the 1st round beating Lincolnshire 21-16, 2nd round beating Northumberland 21-15, in the last 16 beating Buckinghamshire 21-18. On Monday 6th she came up against Izzie White from Worcestershire, going down 21-10 to the eventual competition winner. She also returned to Leamington on Thursday 9th August to compete in the Womens Singles Championship as 3rd place County qualifier. Playing in the preliminary round, she went down 21-7 to the Cumbria A qualifier. Clockhouse were represented by the team of Sandra Ringshaw, Hazel Pudney and Debbie Walmsley in the Brentwood Invitation Triples Gala Day. Sixteen teams took part in the all-day competition with each playing four games of seven ends. Brentwood-based Kings Chase was the only team to win all four games to take the top cash prize with 58 points. Our Ladies were runners-up on 54 points with 3 wins and a draw and Gidea Park B took third place with 50 points. 24 members gathered for this annual Men v Ladies challenge, consisting of 3 rinks each playing 18 ends with the winning team based on overall points. The result was a resounding win for the Men with rink scores of 22-11, 20-8 and a closer 14-13, giving a final result of 56-32. For the third year running Peter Lowe, Mens Captain, accepted the trophy, presented by Joyce Plews who was accompanied by her family to support the event. 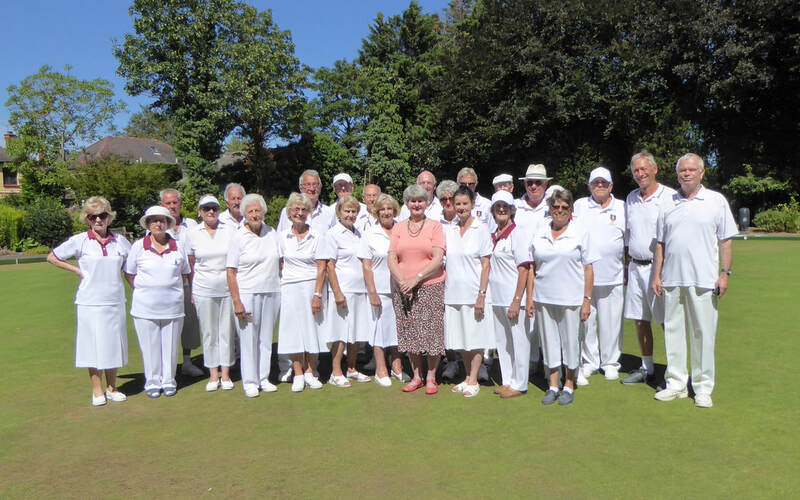 24 members faced the high temperatures we are currently having to deal with, to play in the Hetty Foster mixed triples competition. With the pre-selected triples based on handicaps, each team played 3 rounds of 6 ends, with 2 points for a win and 1 for a draw. ​The winning team was Derek Churchill, Beverley Plank and Derek Baldwin with 6 points, runners up on countback with 4 points were Keith Walmsley, Sally Emes and Alan Jenkins. 22 members took part in the Alvera Plate mixed pairs 2 wood competition on a very warm afternoon, each pair playing 4 rounds of 8 ends. With 2 points for a win and 1 for a draw, the winning pair were Jane Legge and Peter Galloway with 7 points. ​Runners up with 6 points were Val Hayes and Trevor Plank. With a very poor entry, the Mens Selected Pairs competition went ahead with 12 members taking part. Winners on the day were Terry Robson and Peter Galloway with runners-up Peter Lowe and Colin Lincoln. ​​32 members took to the green on this sunny Saturday afternoon for the Presidents v Captains competition. Heading the charge, President Jack Briton's selected rink could not contend with the challenge of Captains, Hazel Pudney and Peter Lowe's rink. However with the final score at 2 rinks apiece, the shot score of 70 - 67 made it a narrow win for the President's team. The competition was followed by a meal in the Clubhouse, which also celebrated the President's birthday. ​Jack Briton relates some Presidential history in his after meal speech. Mens Captain, Peter Lowe presented the trophy to the winners. Hayley played in the County Singles, third place play off against Donna Law of Silver End, at the weekend, and had a comfortable 21-11 win. This means she has qualified for a place in the National Finals at Leamington in August.